Although the name Roberts Radio might not be as familiar to Americans as some other brands, it is one of the longest lived best known British radio companies of all time, founded in 1932 by Harry Roberts and still operating today. From the very beginning Roberts built its reputation on quality designs and workmanship and eventually earned three Royal Warrants, signifying that its products were provided to the British Royal Family. Imagine Robert’s sense of pride when he received a letter from Harrods, a British Department Store informing him that Her Majesty the Queen had purchased a Roberts M4D for her personal use and that she had previously bought another as a present for Princess Elizabeth! 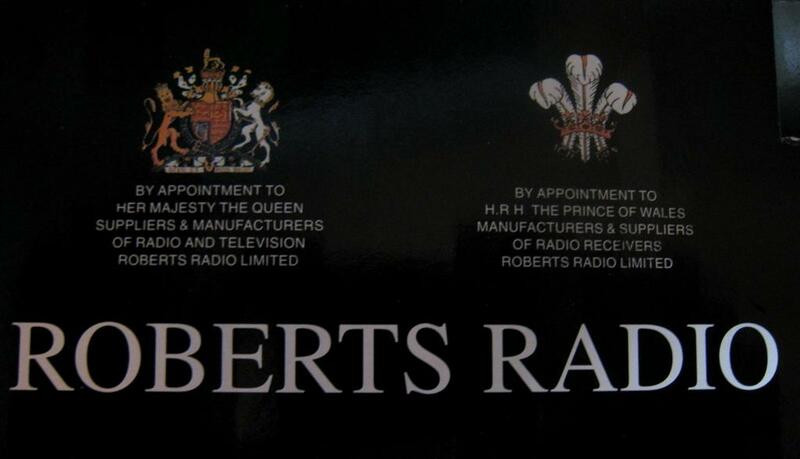 15 years later in 1955 Roberts Radio Co. Ltd was listed as “Radio Manufacturers to Her Majesty Queen Elizabeth II”, and again in 1957 samples were requested in various color options for Buckingham Palace. 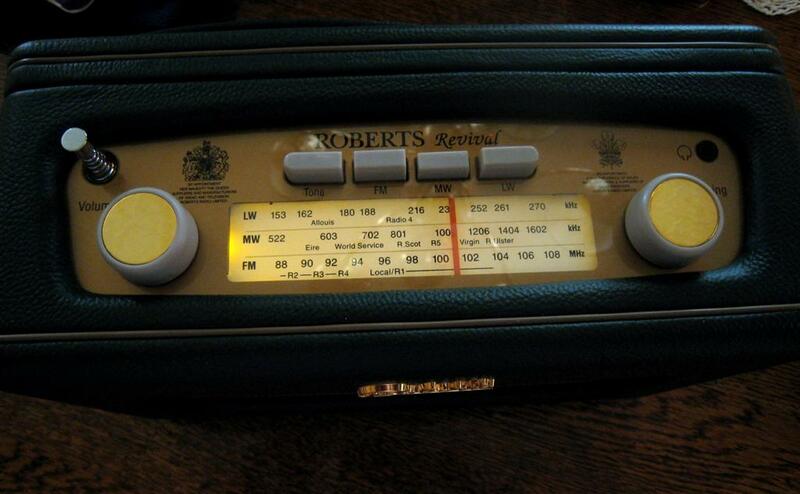 The tradition of Roberts Radio in Great Britain is thus one of pride and honor. Yet Roberts was no conservative British businessman…he was in fact a master at devising clever ways to generate free publicity. One of his marketing strategies was to offer many so-called “specials”…regular production radios offered in varied, sometimes outrageous coverings which allowed owners to flaunt their personal style and taste. Examples included a wildly expensive R200 in a solid-gold case…that one achieved worldwide newspaper coverage. (One wonders how the gold case affected reception). Other specials included a mink-covered RT-1, as well as versions in pony skin, leopard skin, and suede with jewels. Many others were produced in a huge array of colored fabrics and sold as limited editions. 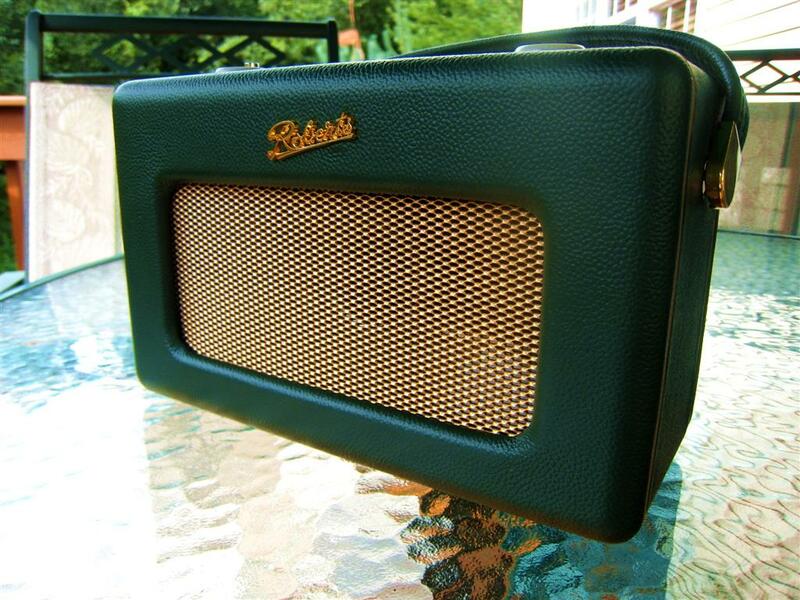 Even today Roberts offers the Revival Radio in the UK in a fourteen color choices as well as real leather or vinyl. Roberts also made good use of celebrities, who were often photographed holding Roberts portable radios…however this was managed is a testament to marketing prowess that would do many companies proud today. More conventionally, Roberts took maximum advantage of the intrinsic quality of his products to gain notice whenever possible. From the Roberts UK website: “The most valuable publicity came simply from demonstrating how good the product was. A request from St John’s College, Cambridge, in May 1959, asking whether a compact, battery-powered short-wave set could be provided for the Cambridge Colombian Expedition, which was sailing in a little over a fortnight’s time; was received with great excitement. A mention in the expedition’s general report was offered in lieu of payment and an RT1 transistor set was hurriedly modified to include short waves, and won high praise by performing impeccably throughout the expedition despite being buffeted about on a pack-mule and exposed to extremes of altitude, temperature and humidity”. Those who love vintage radios and their history will see a similarity between Zenith’s founder Commander Eugene McDonald and Harry Roberts…both were radio enthusiasts and salesmen who knew how to make their excellent products look good before the public. From its beginnings in radio’s infancy to the present day Roberts has offered a huge range of radios, some of which are now rebranded radios manufactured elsewhere and some of which are still manufactured exclusively by Roberts. The Revival R250 is a Roberts exclusive that is now being distributed here in North America by C. Crane under the Roberts name. And what a beautiful radio it is. With 50’s retro styling and a classic wooden case covered in genuine leather, this is a fully analog set covering Longwave, Mediumwave (AM) and FM. C. Crane imports it in 4 colors as of this writing, Caramel Tan, British Racing Green, Blue and Yellow. (Update: The leather versions are no longer available…C.Crane now offers the Roberts in a leatherette version). The Revival R250 is based on Roberts 1st transistorized portable from 1958, the RT1. The C. Crane version features the expanded AM band up to 1710 KHz not available on the European version as well as a Sangean-branded UL listed AC Adapter (120 volt AC to 6 volt DC 400 ma) for use in the U.S. As C. Crane points out, “someone accustomed to a (traditional analog) dial might really enjoy this.” I count myself among them…and for that reason I had to own one. Why Analog – Isn’t That A Step Backward? Definitely…but sometimes taking a step backward is a good thing. Let me explain. At one time, before digital tuning became commonplace, all radios were analog. (I am referring here to digitally tuned radios which have been available since the 1980’s, not today’s digital broadcasting or HD radio which is a completely new technology). Analog radios generally employed variable capacitors and tuned continuously, within specified bands with a simple knob. Performance varied all the way from top notch, even military grade receivers all the way down to the cheapest pocket radios. You twisted the tuning knob back and forth to home in on the best signal…it was simple, mostly intuitive, but sometimes left you guessing as to exactly what frequency you were tuned to. Thus when digital radios with PLL (Phase Locked Loop) technology burst on the scene in the 80’s, they pushed analog radios to the curb. Now you could punch in a specific frequency precisely, and even if you scanned the dial you still had digital readout so there was no more guessing about what frequency you were tuned to. In addition there was no more drifting of the tuned frequency…PLL guaranteed you were locked in. Many other features became possible too as digital radios evolved into mini-computers, using software to control everything from presets to clock and timer functions and nowadays DSP (Digital Signal Processing) to achieve all sorts of signal manipulation. (Preset memory tuning and scanning existed on earlier analog radios but required complex mechanics to accomplish). Digital was a fantastic breakthrough and most of us would never want to do without our digital radios today. Many early digitally-tuned radios did not perform as well as their analog forebears…the very digital circuits and displays which made all sorts of new features possible also generated a hash-like noise which degraded reception. And even the act of manual tuning was often hindered by inter-station muting or spurious noises as the circuitry jumped from one signal to the next. Although most of these problems have since been resolved with more modern designs, many radio enthusiasts cling to vintage analog radios for their natural feel and simplicity. As a collector of vintage radios I can attest to the fact that they are lots of fun to use and there’s just something that seems “right” about an analog radio to an old radio guy like me. When I heard that C.Crane was offering the Roberts Revival Radio R250 I saw it as a unique chance to go back in time…to own a beautiful new, old-style analog radio. Heck…I could skip a few lunches to help pay for it…who needs those calories anyway. I’ll be honest…I was in love from the moment I opened the box. As advertised the leather smell transported me right back to “the old days” when most portable radios came with leather carrying cases or were available in leather versions. I am lucky enough to own a few vintage leather radios and they are beautiful to behold, but to be able to buy a new radio in genuine leather is a treat not to be missed. This radio has instant eye appeal and it also has a very nice, solid feel. Another feature that struck me instantly was that, even on battery operation, the dial light is on whenever the radio is on. While this slightly shortens battery life it is nevertheless specified at 170 hours on a set of 4 alkaline D cells which is not bad at all, and it is very appealing to have the dial always illuminated…that’s a feature I have long wished for in other battery operated radios. Although the dial scale does not give any indication of it, the C. Crane version does indeed tune to 1710 KHz on AM as specified. The radio sports the same dial scale used on the European version which only tunes to 1620 but evidently for the US they stretched the coverage with a circuit tweak. However, the C. Crane supplied owner’s manual is a reprint of the Roberts original, incorrectly specifying the AM coverage out to only 1620 KHz. It also specifies an “AC Mains” voltage of 230 volts but be assured the C. Crane version is supplied with a 120 volt power supply. I must admit I love old analog radios with interesting dial scales and the Roberts Revival dial scale has lots of visual appeal. It is distinctly British with designations representing the 9 KHz AM channel spacing used in Europe. Thus it is marked for medium wave (AM) at 522, 603, 702, 801, 1008, 1206, 1404 and 1602. It also sports country and station markings such as Allouis (France), R. Scot, Eire (Ireland), and (BBC) World Service; designations which many European radios featured back in the late 50’s and early 60’s. Very cool indeed! 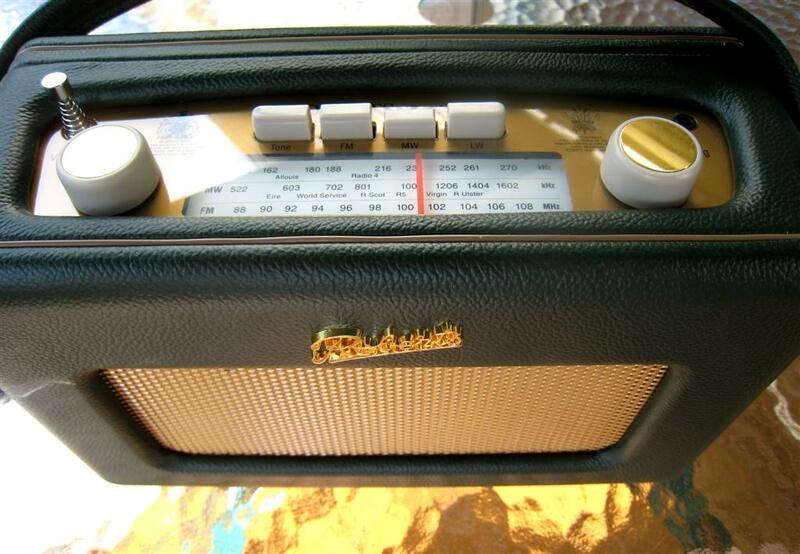 And don’t forget those Royal Insignias…it is intriguing to know this same radio is used in Buckingham Palace! OK…So How Does It Perform? In a word…very nicely indeed. Although not a boombox by any means the sound is pleasant and well balanced…perhaps “polite” as the British might say. It also has good volume, not a surprise given the solid wooden cabinet and 800 mw audio power. The two position tone switch is helpful as well but I could wish for just a bit more crispness in the High position on AM. There is an unusual internal duct about an inch in diameter running front to back…this is to vent the cabinet to augment bass response and eliminate cabinet rattles. 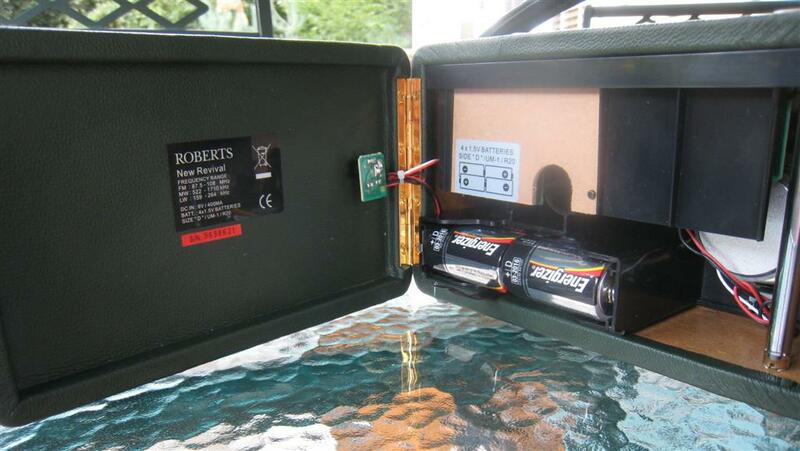 Most radios have air vents on the back for this purpose, but with its solid leather-covered back Roberts found an innovative way to vent the cabinet via the front grill with the use of this duct…very clever indeed! Characteristic of vintage analog radios, only the essential controls are provided; Rotary On/Off Volume and Tuning knobs, three band selector buttons and the tone control button. Rounding out the amenities are an 1/8” mini earphone jack, a DC input jack and the FM rod antenna. The Roberts Revival is not designed to be the hottest DXing portable you can find…it is definitely a radio for the listening enthusiast, especially if you love good old analog radios Nevertheless I was pleasantly surprised that reception is very good on AM and FM…better than many radios I have. LW is not used for broadcast here in the US but enthusiasts occasionally catch navigational beacons or possibly transatlantic reception if they are in a good location for that. But for AM and FM if you like to tune around to see what you can find you will love this radio. As I tuned up and down the AM and FM bands I found all of the weak signals I check when testing radios were there, somewhat to my surprise. To be sure there are more sensitive radios that will pull in weak signals with a bit less background noise but generally I found reception to be very good – all the usual signals I am accustomed to hearing in my area boomed in loud and clear. Also, true to many Europen designs, it is very selective on AM and is therefore a great candidate for use with a loop antenna. I experimented with a Terk Advantage AM loop but there are many small passive loops that work equally well. If you do want to improve very weak signal sensitivity the Roberts responds very well to such a loop…reception of very faint out of town signals became very listenable and impressive. But down and dirty sensitivity is not what the Roberts Revival Radio is all about. What it is about is nostalgia for a time when analog radios reigned and just plain fun. With its combination of solid feel, beautiful leather, an intriguing lighted dial and striking retro European design the Roberts Revival R250 is simply a fun radio to own. To a diehard analog man like me it is a keeper! Addendum: As of this posting C.Crane is clearing out their remaining stock of Genuine Leather Roberts Revival Radios. It will continue to be available at a reduced price in a leatherette version.